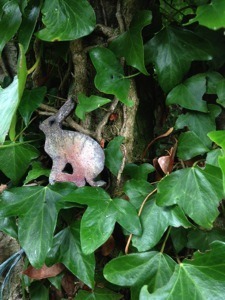 Rites of Way is an interactive journey in the Kingcombe Meadows nature reserve. It uses mobile computing technologies to deliver an engaging experience in a centuries-old landscape. It is a pilot, commissioned by the Dorset Wildlife Trust with Arts Council funding from the Dorset Design and Heritage Forum’s N3 project. The concept, user interface, icons and technology were developed by Sharon Hayden and Alastair Nisbet, with tree stories adapted with, and narrated by, Ian Siddons Heginworth and mono-printing by visual artist Heidi Steller. We wanted to create an immersive experience which was location based and came up with the idea of a journey incorporating ancient routes used by rural communities - the Drovers’ Route and Mrs Cleall’s Route. Participants touch a leaf to listen to a tree story, swipe the tree wheel to change trees, click on a leaf to upload their photographs and touch the deer to listen to the guide who gives the journey directions. Funding permitting, ScreenPLAY are hoping to refine, develop and extend the project with the creation of an iphone and Android app plus additional features we could not include in a limited size web version. 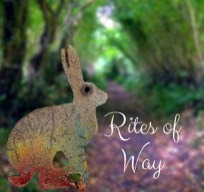 Rites of Way will be launched by the Wildlife Trust in Spring 2014. If you would like to experience it first hand before the launch, or need more information about the project, please contact us using the link at the bottom of the page. Our aim was to marry the high tech world of mobile devices with the natural environment to create an interactive experience that uses technology as a tool to enhance the live, immersive trail. We set out to create an inviting aural world, which encourages you to engage with the natural environment. You have to search out 12 trees, find a badger set, ant hills, six flower species, woodpecker holes in tree trunks, cross a river and walk through a wood. It is a nature trail in every sense, but with the depth of an arts experience. The more you are immersed in the environment the deeper your experience becomes. We wanted to introduce the alchemy of change. From the prima materia, trees grow as in the ash story, and from burning clay, our golden icons are created. The icons have a second use: suspended on fine lines from a lightning struck oak and ash in the middle of each journey, they become a centre, an opportunity to turn and look out to the horizon, while reflecting inwards on the stories you have heard.The hare and the deer raku icons also become the guides, leading you on your journey. If we allow ourselves, we can take on the tree of life stories to a much deeper level. This is a metaphysical journey as well as a physical one. We are guided by nature to our hearts, to our emotional centre while journeying around this ancient green environment. Trees can speak to us about strength, anger, joy, love and sadness and we can express ourselves and reflect on our life experiences here.